WASHINGTON - John M. Logsdon has been named one of the 24 members of the NASA Advisory Council (NAC). Logsdon, who directs The George Washington University's Elliott School of International Affairs' Space Policy Institute, will serve on the Council's Exploration Committee. NASA describes the council as "a group of eminent U.S. citizens organized to provide guidance and policy advice to the administrator of America's space agency." "I am pleased to be among this distinguished group of advisors as NASA pursues the vision of sending humans back to the moon and then, sometime in the future, on to Mars," said Logsdon. A respected source frequently consulted by the media, Logsdon, who also is a professor of political science and international affairs, teaches graduate courses in space policy and leads various research projects on space issues. His research interests encompass all areas of U.S. and global space policy and history, with particular attention to top-level decisions that define future space efforts. At the advisory council's inaugural meeting on November 29-30, NASA Administrator Mike Griffin (M.S.C.E. '98) said, "The privilege of giving formal advice to NASA that we should listen to is a privilege that has to be earned ? and it should be accorded to those people who have the highest credentials of accomplishment in fields of endeavor relevant to our business. I think that this panel today represents a group of such people." On Logsdon's appointment, GW President Stephen Joel Trachtenberg said, "Being named to the NASA Advisory Council is a professional milestone for John. His commitment to public service and his vast knowledge of space policy benefit our nation as it prepares to expand its space exploration." Former Senator and Apollo 17 astronaut Harrison Schmitt chairs the NAC. Among its other members are Apollo 11 astronaut Neil Armstrong, retired Generals James Abrahamson and Lester Lyles, and other eminent individuals from the research, industrial, scientific, and management communities. Logsdon joined GW in 1970 and is the founder and current director of the University's Space Policy Institute. In 2003, he served as a member of the Columbia Accident Investigation Board, and he has received NASA's Distinguished Public Service Award. Logsdon received a B.S. in physics from Xavier University and a Ph.D. in political science from New York University. The Elliott School of International Affairs at The George Washington University is one of the nation's leading professional schools of international affairs. The school features world-renowned faculty that provide students, the policy community, and the public with in-depth analysis of international economic, political, and scientific issues, and the historical and cultural factors shaping them. The Elliott School prepares students for an extensive range of international affairs careers in the business, nonprofit, and government sectors. Elliott School alumni can be found in leading decision-making positions all over the world. 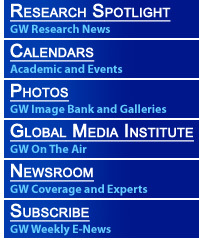 For more information about GW's Elliott School of International Affairs, visit www.elliottschool.org.